Summer days are drawing to an end, but gardeners looking to maximize the growing season have some options for planting, even as they harvest other crops. And there’s plenty to pick in the WTTW garden. One of the crops flourishing right now: okra! “It’s a prolific plant,” says organic gardener Jeanne Nolan. “It’s hard to stay on top of it, but it’s delicious.” She even eats small okra pods raw. A pod that grows too long can still yield seeds to plant next year. Or, turn them into stamps. “It’s one of my favorite plants to grow,” Nolan says. In the WTTW garden, a red okra variety shades peppers, which can be prone to sunscald. Gardeners can remove plants that are finished growing; today, Nolan takes out green beans that are past their prime. The resulting space can be used to plant greens from seed, even in September. Greens will grow through the fall, as opposed to other vegetables, which require hotter weather and more sun. Nolan joins Phil Ponce in conversation. Aug. 16: The founder of The Organic Gardener says she always felt a strong connection to nature. “My garden is really a big part of where I like to spend my time and to feed my soul,” she said. 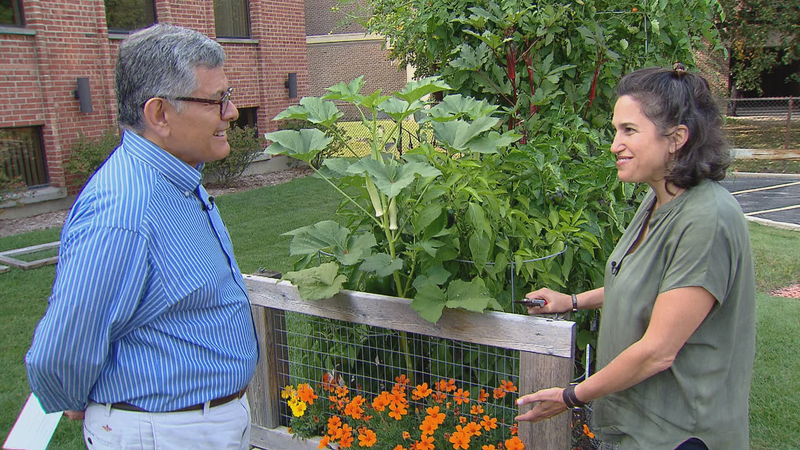 Aug. 10: It’s been a bountiful season for Chicago’s urban gardeners. Jeanne Nolan, The Organic Gardener, joins us with an update from our very own organic garden. July 18: Summer is in full swing, and the WTTW garden is in full bloom. Lots of vegetables are ready to pick and to eat.